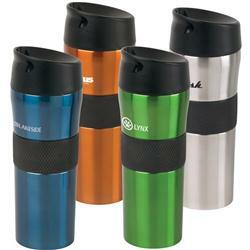 The Aura stainless steel double walled vacuum sealed spill proof travel mug or tumbler. This is one of our favorite mugs. 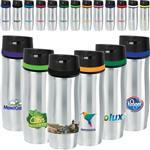 If you want quality and features, this custom travel mug will surpass your expectationas. Featuring our new patent pending designed lid that features lip and finger grooves that allow you to position the drinking spout without even looking. Includes a leak proof screw on lid with a visual open/close push button locking closure that can come apart for easy cleaning. Made of FDA compliant materials. Dual wall construction with 18-8 Stainless Steel vacuum insulation that will hold your beverage at the ideal drinking temperature at least 8X longer, Includes a silicon non-slip band. FREE RUSH AVAILABLE! Production Times Available: 7 working days. FREE RUSH AVAILABLE! Dimensions: 20 oz. 9 1/4"h x 3 1/4"w x 3 1/4"d.
Typical Imprint Area(s): 1"H x 2"W per side. 1.75"H x 1.75"W for laser. 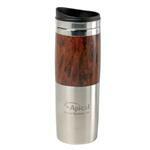 Available Imprint Options: Color Print or Laser Engraving. 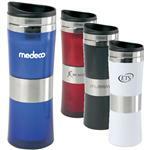 Vaccuum Tumbler, Double Walled, Stainless Steel, Screw On Spill Proof Lid, FDA approved materials.